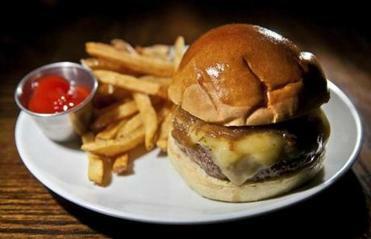 Boston’s burger scene is getting bigger and better. This American classic is suddenly a hot dish. Here’s what chefs are doing with the best bites you can get on a bun. Reviews written by Anna Burgess, Devra First, Sheryl Julian, Matt Mahoney, Anne V. Nelson, Barbara Pattison, Jason Pontin, Rachel Travers, Eileen McEleney Woods and Lisa Zwirn. 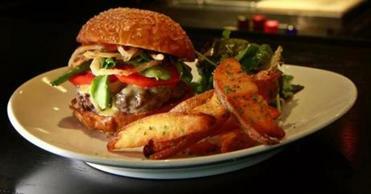 Tucked into the corner of a cozy atelier, 80 Thoreau’s bar is a great place to enjoy the gourmet burger. Dressed with aged Grafton cheddar, mayo-based house sauce with grainy mustard and a hint of cayenne, and served on a tender brioche bun, the burger comes with exceptional fries, homemade ketchup, and assorted pickles (currently baby turnips, carrots, and radishes). The bar feels like a club. It can be hard to flag the bartender, but when you do, he’s attentive, and the reward is on the plate. — S.J. Bean burger at Audubon Circle. A well-seasoned patty made of black beans, pinto beans, corn, barley, and corn chips spiked with garlic and ancho, among other seasonings, this veggie burger doesn’t pretend to be beef. It comes with lettuce, chipotle mayonnaise, and tomato-cilantro pico de gallo on a French bread roll, soft on the inside, a touch of crust on the outside. Crispy roasted potatoes with house-made spicy ketchup round out the plate. — R.T. The West Side Burger at B.Good. If you like your burgers as saucy as an 8-year-old at her big sister’s bat mitzvah, then you’ll love B.Good’s West Side. The 4.5-ounce patty is slathered with homemade chipotle salsa and a mash-up of avocado and fresh cilantro, along with sliced tomato. B.Good is a hand-cut above the typical fast-food joint, the locally grown chain’s claim to fame its locally sourced food. The beef is ground in-house each morning, the veggies bought direct from the farm (at the Hingham location, some even come right from the garden). The just-right buns arrive fresh daily, and there’s a gluten-free version. Even rarer in the burgers-under-$10 world: Order yours cooked any way you like. — B.P. The burger at the Back Bay Social Club. New York and experimentation with different blends of meat. The result: a rich, juicy 10-ounce patty made from dry-aged beef, seared on a super-hot flattop griddle, and topped with smothered onions and aged cheddar. It comes on a straightforward bun that doesn’t distract from the mellow, meaty combination of flavors inside. — D.F. A burger and fries at Five Guys Burgers and Fries in East Walpole. 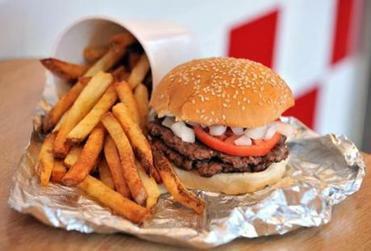 No wonder national chain Five Guys Burgers and Fries was hailed in a Washington Post review as the “Willy Wonkas of Burgercraft.” Like Veruca says, “I want the works, I want the whole works!” And here, you’ll get it. Snap open some free roasted peanuts by the register, then customize your burger order with anything from jalapenos to A1 steak sauce to grilled mushrooms. Concoct your own drink at the computerized Coca-Cola Freestyle machine — available at some of the 25 Massachusetts locations — which offers beverages ranging from the ordinary to the out there (think Fanta Lime). — E.W. This is fast food done right: Five ounces of ground beef seasoned with just salt and cooked to order, it comes with lettuce and tomato and with a pick of bun, from white or whole wheat to gluten-free. Choose from eight kinds of cheese, plus smoked bacon, caramelized onions, guacamole, and more. While you’re there, order at least a small side of “half & half” fries — a mix of regular and sweet potato. And there’s a treat in the fridge, too, bottles of Mexican Coca-Cola (made with cane sugar, not corn syrup). The two-location chain is locally owned. — R.T. 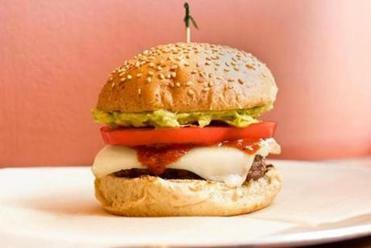 The Four Seasons Hotel’s restaurant makes a hamburger that tastes like it’s from the Four Seasons. The beef is a special blend from Painted Hills in Oregon that’s ground cold, hand-formed, then raised to room temperature for cooking. In addition to the aged cheese, house-baked brioche roll, lettuce and tomato, and house-made pickles, it comes with truffle fries, so you don’t even resent the $21 price. On Wednesdays, also known as “Burgers and Burgundy” night, there are more choices, including the Croque Madame burger with Mornay sauce, gruyere cheese, and a fried organic egg. — R.T. Chef owner William Kovel of Catalyst restaurant in Cambridge. The luxurious 8-ounce burger here isn’t made from pastured beef and wasn’t ground from cattle roaming New England farmland. It’s moist, juicy North American corn-fed beef with enough fat to give it a grand taste, cooked until medium-rare and covered with caramelized onions and slow-roasted tomatoes, all tucked onto a brioche bun with homemade cherry-pepper ketchup and a lemony aioli. If you’re at the bar and a skilled barkeep hears you and a friend say you’ll split it, the burger will arrive already halved with your own heap of gorgeous fries. Owner William Kovel was a chef at the Four Seasons Hotel Boston. The attention to detail shows in this one beautiful plate. — S.J. The Classic Burger at the Cottage. This suburban destination for contemporary food is getting a reputation for its burger. An 8-ounce patty of prime beef is grilled per your preference and topped simply with lettuce, tomato, raw red onion, and your choice of cheese. No tricks here, and it comes with great fries. — R.T. The burger at Craigie on Main in Central Square. 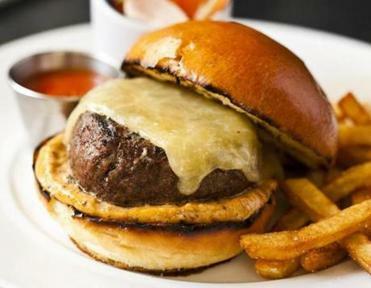 The burger at the bar at Craigie on Main (when it’s on the menu, which is much of the time) may be the Boston area’s most acclaimed, perhaps to the chagrin of Tony Maws. What ambitious chef wants to be known for his burger? But Maws outdid himself with this creation, and you can’t blame diners for recognizing that. The 8-ounce patty is made from grass-fed short rib, brisket, and flap steak, with suet and bone marrow added for richness. But the real secret is dehydrated miso, for a burst of umami. It’s a flavor bomb on a bun, served with house-made ketchup, cheddar, crispy onions, and watercress. — D.F. Firebrand Saints, housed in a former Domino’s Pizza location, is just the restaurant Kendall Square needed. 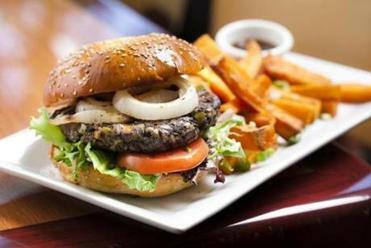 Launched by MIT’s investment management company and Gary Strack, the chef and owner of Central Kitchen in Central Square, it offers several burgers and a tempting variety of extras, including different cheeses, balsamic grilled onions, and the house’s own ketchup. But if you ask the waiters about any of these add-ons, they’ll sternly warn you away. The waiters are right. The 8-ounce lamb and sirloin comes with spicy pickles, frisee, and harissa aioli and has the unapologetically gamy taste of good lamb, the sirloin serving mostly to deepen the flavor, the pickles and aioli providing brightness and heat, and the frisee giving a little texture. It’s the right combination, simple, perfect. — J.P. The Gallows can get elaborate with its burgers, topping them with the likes of spicy peach chutney, Vidalia rings, greens, and goat cheese or miso mayonnaise, Spam, fried egg, and seaweed. 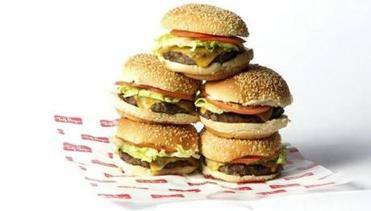 But it’s the Our Way that satisfies the craving for an American classic every time. It’s a griddled patty, thin but not dry, on a buttered, griddled roll, with American cheese, grilled onions, iceberg lettuce, and house-made pickles. It’s like the drive-through burger of your dreams. — D.F. Prime Burger at JM Curley. When you think “burger,” you probably imagine something like the one at JM Curley — if you have a good imagination, that is. Although it’s not fancy, it’s just . . . right. Come for dinner and you get a beefy grilled 10-ounce patty on a toasted sesame bun with pickles, caramelized onions, cheddar, and house-made Russian dressing. At lunch, the sandwich features a 5-ounce griddled patty. Which do you prefer? The only thing to do is come at night after 10:30 and try them both. Along with grilled and griddled burgers, the late-night menu offers a slew of toppings (sometimes even peanut butter). — D.F. At this popular neighborhood pub in West Newton, the burger plate is an understated treasure. The large, meaty patty is made from prime beef — an 80/20 mix ensures the burger’s juicy — and topped with lettuce, thinly sliced pickle, onion, and tomato, and served on a brioche bun. The addition of tangy cheddar and smoky bacon makes each mouthful sing. Go the distance and order the truffle Parmesan fries, which are cooked to perfect crispness. — L.Z. The King at Boston Burger Company. Inspired by Elvis Presley’s legendary sandwich tastes, The King is far from traditional, but the fried cinnamon banana chunks, bacon, and peanut butter — yep, on a burger — shock your taste buds in the best possible way. Boston Burger Company serves up to 28 different burgers, some of them crazy concoctions like The King or The Kitchen Sink (it comes with everything but), and some more traditional. With its fun vibe and reasonable prices, the place is loved by Davis Square locals. A second venue is now open in Boston. — A.B. Prime Chuck Burger at Porter Cafe. There are occasion burgers — expensive, gussied-up sandwiches for which you make a special trip. Then there are everyday burgers, the kind you want to eat once a week with a beer at your favorite neighborhood joint. 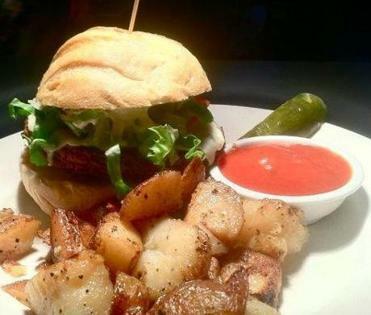 In West Roxbury, Porter Cafe serves an excellent everyday burger, perhaps because it’s an excellent neighborhood joint. Eight ounces of prime chuck, the patty is beautifully cooked, topped with cheddar and a sweet and tangy red onion relish. It’s perfect by itself, but adding bacon doesn’t hurt. — D.F. Icob Oyster Burger at Island Creek Oyster Bar. White wine with a burger? Yes, if it has fried oysters on top — and oh, that’s the way you’ll want your burger at the Island Creek Oyster Bar. The 8-ounce patty comes topped with crunchy oysters, soft and smoky bacon, sour pickled onions, and hot horseradish mayonnaise. Split one with a good friend (get your own order of the killer fries), and enjoy it with a couple of glasses of sauvignon blanc or anything with similar bite. — A.V.N. Zen Veggie Burder at Red Lentil Vegetarian & Vegan Restaurant. Watertown’s Red Lentil chef-owner Pankaj Pradhan says he named the restaurant’s vegan patty the Zen burger because it represents “everything in one burger.” And so it is, as the thick, tasty patty is made from black beans, brown rice, onion, carrot, celery, rice flour, seasonings, and fresh herbs. A dash of gluten-free soy sauce lends a rich, savory flavor. Seared and served with homemade Thousand Island dressing, caramelized onions, baby greens, and tomato, the burger is indeed an edible symbol of completeness. — L.Z. Don’t look at this as a burger. Look at it as a dish at a fine-dining establishment, albeit one served in the bar area. For this sandwich isn’t just about the patty. It’s about the package, a beautiful synthesis of rib eye and chuck blended together, topped with horseradish sauce, cheddar, and crispy onions, framed artfully by a brioche bun. The flavors come together in perfect harmony. — D.F. Red Robin’s Bleu Ribbon Burger. The Gourmet Cheeseburger may be Red Robin’s bestseller, but the national chain’s Bleu Ribbon should be prized for its exotic flavor. 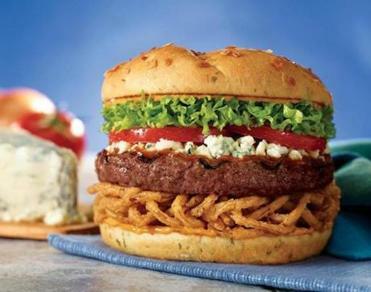 Each bite delivers the tangy combination of crumbled blue cheese, Heinz 57 steak sauce, lettuce, tomatoes, crispy onion straws, and zingy chipotle mayo on an onion bun. This jumbo-size burger costs $9.99 and leaves little room in that plastic red basket for the Bottomless Steak Fries. Add even more zip with a shake of herb- and spice-filled house seasoning. — E.W. The open grill behind the bar takes center stage at this lively, unpretentious pub near Union Square in Somerville, where burgers are the main attraction. 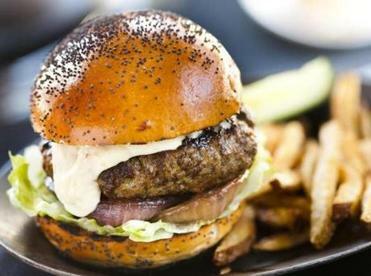 The cooks take care not to press down on the large, loosely formed patties when they’re over the flame, so a burger ordered rare comes truly rare: nicely charred on the outside, but still cool at the center and bun-soakingly juicy. 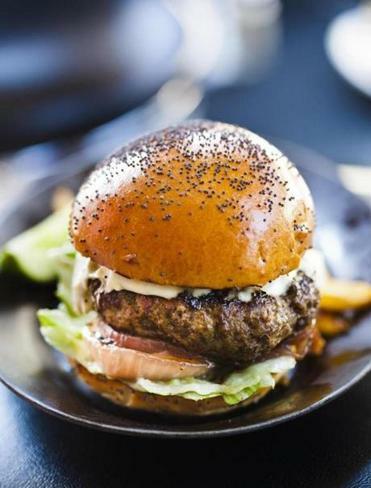 The menu has two dozen varieties of burgers to choose from, but the simple combination of salty blue cheese and plenty of black pepper provides just the right tang and kick to complement the beef. — M.M. At this Watertown hole in the wall, only a limited number of burgers are made every day, and when they run out, that’s it. Each patty is fashioned from 9 ounces of chuck mixed with beef cheek and trimmings from the restaurant’s skirt steak; the grinder is kept in a freezer to enhance the meat grind, and seasonings are whipped in. 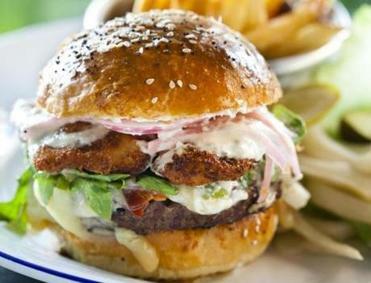 Topping the burger are lettuce, tomato, a slice of lightly pickled grilled red onion, and a lemon confit aioli. It’s served on a specially made Iggy’s brioche with poppy seeds, and the grilled bun gets a generous slathering of smoked white miso butter. — R.T. The hamburger at Tasty Burger. It’s crazy that no one came up with Tasty Burger before Dave Dubois opened this Fenway spot (in spite of a licensing delay, the company plans to open South Boston and Cambridge locations this year). The 5-ounce hamburger with lettuce and tomato ($3.95) comes wrapped in paper. Fries make such a short trip from their fat bath to the table that they’re amazingly hot and crisp. You could get in and out of this funky 77-seat place in a breeze, if only the servers were as skilled as the cooks. — S.J. Ten Tables owner Krista Kranyak recently opened a burger bar, Grass Fed, near her beloved Jamaica Plain restaurant. 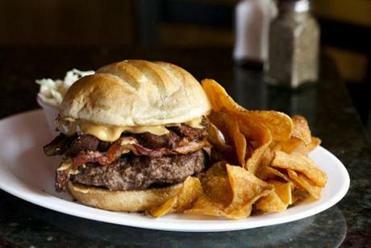 But the original restaurant’s own bar burger still has the edge — humanely raised beef cooked to order, served with good cheddar, caramelized onions, the restaurant’s “A-10” sauce, and luxurious bacon aioli. Oh, there’s lettuce on there, too. So healthy! The best time to snag this burger is during “Beerger Mondays,” when you get a burger, house-made potato chips, and a signature TT Beer for $15. Just expect crowds. — D.F. 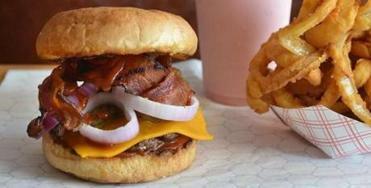 A Bubba BBQ burger at Wild Willy's. Don’t be fooled by the cutesy Western decor — Wild Willy’s takes its burgers very seriously, and they are seriously good. The Bubba BBQ is topped with barbecue sauce, cheddar cheese, onion, and bacon, all of which enhance the burger’s flavor without overpowering it. Have a fresh-squeezed lemonade or housemade raspberry lime rickey with yours. — A.B.